After centuries of wondering, men can finally work out if their partner really is ‘fine’ or not thanks to a new dress that changes colour depending on a woman’s mood. The Bubelle Dress is made up of two layers, the inner layer contains biometric sensors that pick up a person’s emotions and projects them in colours onto the second layer, the outer textile. 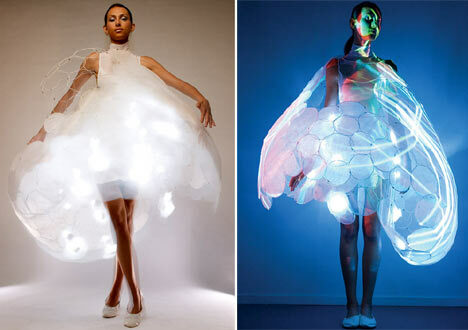 The sensitive dress, which was designed by electronical giants Philips, works by monitoring physical changes associated with different feelings. Emotions such as stress, arousal, or fear affect the body’s temperature and sweat levels and these generate the light that changes the pattern and colour on the dress. Should the prototype ever hit the high street it would help British couples to communicate better. It was developed as part of the SKIN Probe Project, a research programme concerned with what lifestyles might be like in 2020. Time magazine named the impressive clothing as the best fashion invention of the year. Scientists at the Dutch firm have also designed emotion-sensitive electronic tattoos as part of their design project. A spokeswoman said: “In much the same way as make-up is put on and taken off to suit the occasion, a tattoo could alter whenever desired. Sweet holiday mix ~ Download this peeps! 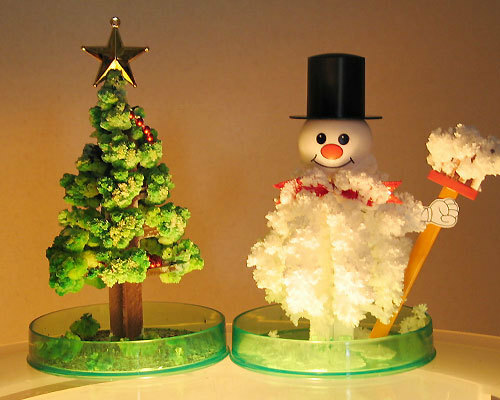 This is a neat little twist on the traditional tree/snowman Christmas decorations. These cute puffy little things actually come packaged as folded-up papers in a petri dish. When you put water in the dish, the fluid slowly creeps up the paper and makes it unfold into these and other lovely shapes in a matter of hours.